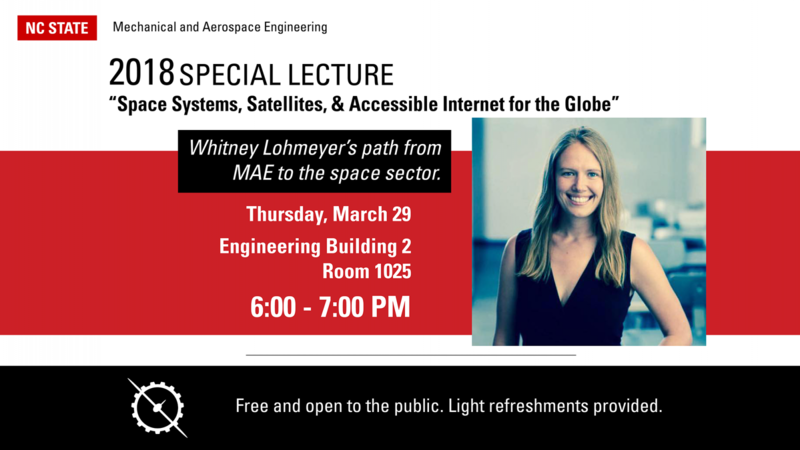 Join us in welcoming alumnus, Whitney Q. Lohmeyer, as she speaks about her journey from MAE to the space sector. Whitney graduated from NCSU in 2011 with a B.S. in Aerospace Engineering. While at NCSU, Whitney led the NCSU AIAA student chapter, participated in undergraduate research, worked with NC Space Grant and started a group for undergraduate women in Aerospace Engineering at NCSU. After receiving her B.S., she earned her M.S. and Ph.D. from MIT in Aerospace Engineering, focusing on satellite communications systems, and later went on to work as a Systems Engineer at OneWeb, where she has been for the past four years. Whitney will be speaking about her journey thus far, the lessons she has learned along the way, and how her undergraduate experience at NCSU impacted her career. She will also be speaking about opportunities in the space sector and at OneWeb.